Discription: Limited edition LP, Silk Screen covers. 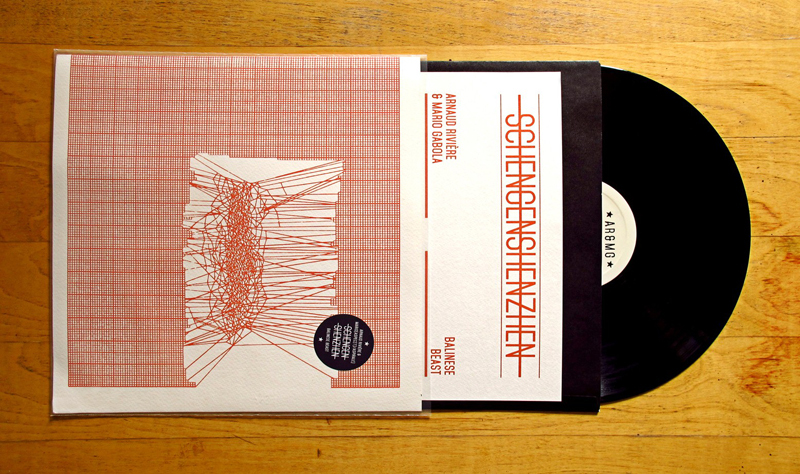 SchengenShenzen has just been dropped off and, oh boy, did this took quite a good deal of effort to come out as it not only assembles two of the most intriguing European noise/imrpov duos, namely Arnaud Rivière / Mario Gabola and Balinese Beast, it was also co-released under the aegis of three different labels, Athenian weirdo outlets Phase! and More Mars and Mario’s own venture into improvised music, Viande Records. The first side, moving closer to the harsher end of the spectrum, is dedicated to the documentation of a live collaboration from 2011 between Parisian turntable mutilator Arnaud Rivière who’s using reconstructed phonographs and prepared mixing boards and Mario Gabola from Naples who is one half of Aspec(t) and one third of A Spirale – for the purposes of this recording he provides feedback and resonance by self-made instruments and percussion. The opening track, Fragment is a really hard-edged but neat assortment of hisses, distortion, percussive patterns, silence and feedback failures adorned towards the end by spastic crashes, howls and turntable onslaught. It Is Quite Complicate on the other hand is a way more solid artifact whose radio fragments of the first seconds give way to an avalanche of textured noise and monumental eruptions. This Is No Sax Song briefly closes the side with fast-paced flops, metallic clangs, chopped feedback and tiny pauses. On the flip-side, Athenian charmers Balinese Beast (Giorgos Axiotis and Ilan Manouach), counting more than ten releases over the past four years, attempt here a shift from their usual frenzied and hyper-active cut-up style towards somehow longer structures – despite the fact that once again they succeed to pack five tracks in less than 18 minutes using their routine gadgetry of samplers, drum machines, no input mixers and free saxophones. Still, their material is hard to pin down. The opening track Pronounce features a really superb upright bass sample that acts as a nexus that holds the piece together and is occasionally decorated by sparse drum machine patterns and exquisite reed blowing. The static that opens Colcannon Night is held together by a constant metallic hum, gradually sliced by noises and sampled jazz tracks, ending with some sweet sax playfulness, while Midi Market features some oriental pipe patterns, overwhelmed by some Euro-dance sounding raw synth build-ups. Thanks Mom is a typical Balinese smart cut-up and rearrangement celebration but one of the highlights is the closing track La Dépêche De Tahiti, a true slow burner with an elegiac opening, a few slow moving layers of mournful sax and some delicate gestures on top of spiraling synth lines. Overall, a record that places all four of them in the highest ranks of the freak register.